LOOKING FOR LANDSCAPE SUPPLIES IN SOUTH BRISBANE? WE'VE GOT YOU COVERED! Wellers Hill Hardware and Landscaping Supplies is your local hardware experts. Wellers Hardware is a family business run by local brothers Gerard and Paul Lenarduzzi. With over half a century of landscaping experience between them, your next landscaping project is in good hands. We stock everything you need for your next job, whether you’re a tradie looking for bulk Brisbane landscape supplies or you’re just working on your own DIY project. Our reputation of quality products and friendly service has seen us survive the recent opening of retail giants in our surrounding area. We pride ourselves on our satisfied customers throughout the south Brisbane community. Wellers Hardware are part of the Mitre 10 True value group which means you can get quality branded products at competitive prices. We sell a wide range of gardening and landscaping supplies and can offer free, expert advice on any DIY project you have. 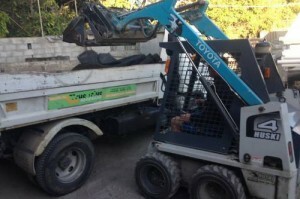 As one of the leading hardware and landscaping supplies stores Brisbane wide, our Tarragindi store has a drive through yard where you can pick up sleepers, sand, cement, soil and many other landscaping supplies in the middle of Brisbane. We also run a Brisbane wide delivery service. So now you can have landscape supplies, tools, gardening equipment and so much more delivered to your doorstep with a quick phone call or online order. We pass our savings on! Email wellershardware@iinet.net.au or contact the store on 07 3848 1682 to get a quote or organise a delivery.